The Plexidor Security Cover is the genuine fit for your Plexidor pet door. It fits all door, wall, and glass units. Offers extra security for your pet door and home. Close off the pet door opening when you are away from your home. Screws onto the Plexidor pet door interior frame. For Medium, Large, and X-Large Plexidor pet doors. Refer to the PlexiDor Size Chart shown below to determine the size pet door you require. Once you know the correct size for your pet, be sure to review the installation information. If you have any questions please call 1-800-749-9609 FREE for assistance. To view the complete chart, please access this page with a larger device or download the PDF. 6 1/2" x 7 1/4"
8 3/4" x 8 5/8"
11 1/2" x 13 5/8"
14 1/4" x 17 5/8"
14 3/8" x 18 3/8"
15 3/4" x 23 5/8"
15 1/4" x 23 5/8"
18 1/8" x 25 1/4"
12 5/8" x 19 5/8"
14 1/4" x 21 3/8"
† Note: There are two dimensions for the Wall Series cut hole, interior and exterior. Read the installation instructions carefully before cutting. ‡ Dimensions listed in chart are Width by Height. PlexiDor offers three elegant colors to compliment the decor' of your home. Choose from White, Silver or Bronze. Silver frames feature an anodized finish. White and Bronze frames feature a baked-on powder coating for increased durability, similar to the appliances in your home. A PlexiDor Pet Door is by far the most attractive pet door you will ever install in your home. Our finishes will integrate perfectly into your home! 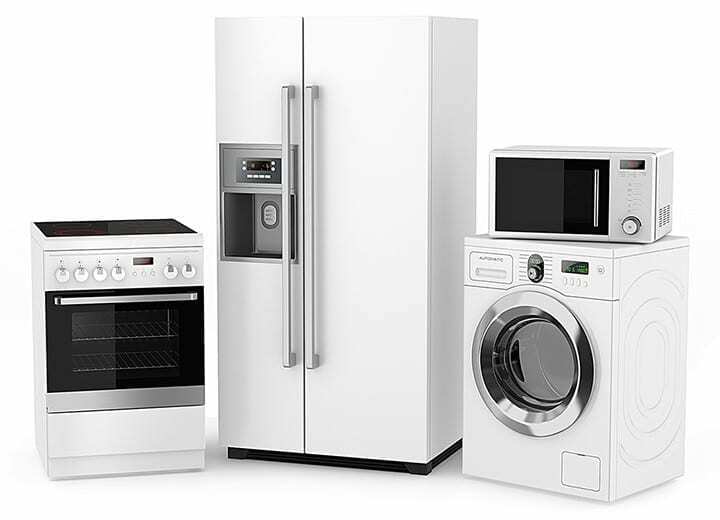 The white finish highlights common household appliances as well as most baseboards and trims and blends with most traditional decors. The silver finish coordinates with newer stainless-steel appliances and looks great in a modern setting. The bronze finish works well with darker toned furniture and accessories by adding an updated feel to the room. A baked-on powder coated finish is far more durable than conventional paint. Powder coated surfaces are more resistant to chipping, scratching, fading, and wearing than other finishes. Installing a PlexiDor keeps the heating and cooling inside your home! Installing a PlexiDor Performance Pet Door into your home could save you as much as 10% off your energy bill. Review the chart below to determine your estimated annual savings. Saving 10% per month could save you $900 in just 5 years. Above estimates are based on average seasonal temperatures and household temperature settings. Results are typical of PlexiDor owners and are based on more than 25 years of customer feedback. Individual results may vary based on household insulation, age and size of home. Safety for you and your pet is our highest priority. Each door comes with a lock and key and a steel plate that can be easily attached on for extra security. All models come with a lock and two keys for everyday use. Just turn the key to lock out unwanted guests. Heavy duty steel lock visible only from the inside resists tampering. The small size door has a four-way lock that can be set to open, locked, open for entry, and open for exit. Medium and large size PlexiDor dog doors include a steel security plate that screws on easily when you leave for an extended period of time. To use the security plate daily, install the optional PlexiDor Sliding Track – so the door can be conveniently dropped into place and closed with a flip lock in seconds. Small size doors are too small for an intruder to enter and do not come with the steel security door. Installing your PlexiDor Pet Door at the correct height will ensure the door is comfortable for your pet to use. Stepping up and through the door is best. These measurements are a guide only, make sure the pet door is installed so that the opening is at least 2″ above the pet’s back. There is only one size for electronic doors, you will need to estimate based on pet size. IMPORTANT: Install the dog door so that the finished dog opening height is approximately two inches (2”) taller than the dog’s back. Check out the Learning Center Installation Page for more. Can I install a pet door through a wall? Installing through a wall can be trickier than installing through a door – it is more difficult to make a hole in the wall than through a door. You also need to check if it’s a load-bearing wall or not. 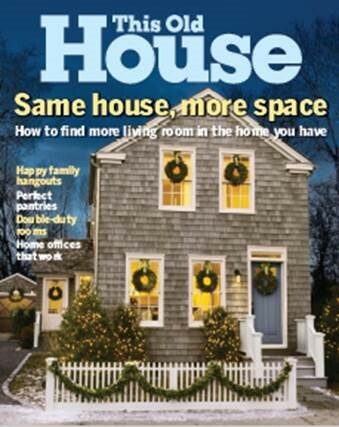 On an episode of This Old House, they went the whole 9! Check out their work replacing the exterior siding around the door for a classic look that blends right in to the adjacent house door. We are confident you will find that a PlexiDor Performance Pet Door is a superior product of the highest quality, and the best value in a pet door. PlexiDor pet doors come with a 10 Year Warranty. Our Electronic pet doors feature a 5 Year Warranty. All PlexiDor pet door products include a 90 Day Money Back Guarantee. While under warranty, any defective part will be repaired or replaced free-of-charge, including standard shipping service. (Labor is not covered.) If for any reason you are not completely satisfied with your PlexiDor purchase, simply return it within 90 days of purchase and we will reimburse the full purchase price. Shipping charges are not refundable. PlexiDor can help you choose the best dog door selection with our standard dog doors, extreme weather dog doors, and lockable dog doors to fit every size of pet. PlexiDor doggie doors are available in small pet doors, Medium pet doors, large pet doors and extra-large pet doors. PlexiDor’s saloon style pet doors are energy efficient dog doors and cat doors. The heavy duty dog door works for big dogs and small dogs alike. 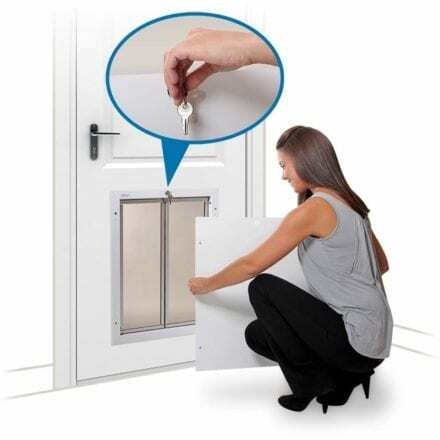 All the pet doors are safe and secure and can be easily unlocked and locked. 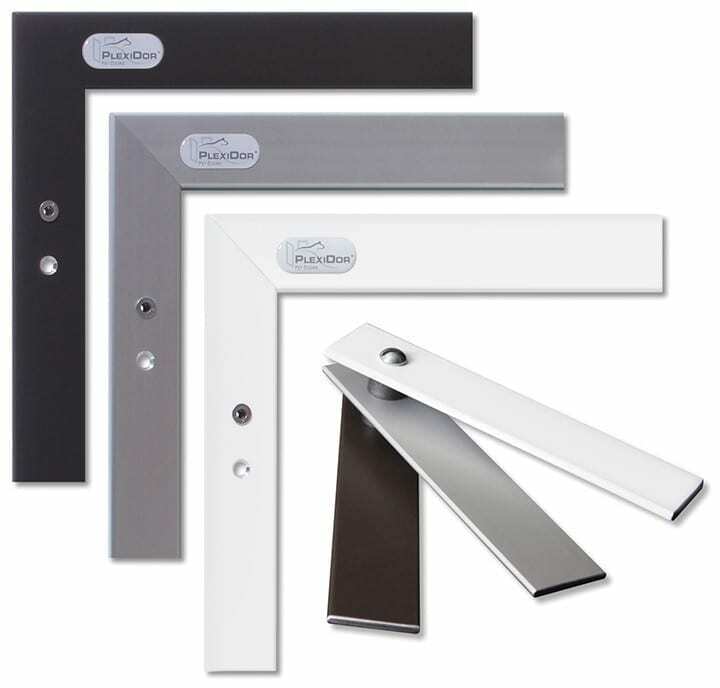 PlexiDor offers many installation options – door mounted pet doors, wall mounted pet doors, window pet doors and even for sliding doors. They can be installed in metal or plastic screen windows or doors and are popular dog doors and cat doors for exterior walls. When you are ready to fix your low quality dog flaps with a high quality pet door, PlexiDor Performance Pet Doors are your choice. International Support:Click for a list of international dealers. 2019 PDUSA, Inc. All rights reserved. (12-16) Specifications, appearance and features of items in this website may change without notice.